The ‘Living Stones’ Community Siena was born after experiencing an evangelization and the service it provides: over the last years, we requested the Living Stones as guides for our visits in different cities. Getting in touch with this reality has aroused in our heart the desire to start forming ourselves in order to inwardly participate in the beauty that welcomes our prayer every day, and that reminds us of the beauty God has coloured our lives with. We are a very young community, which has begun to take its first steps last year in December. We tried to spiritually enter a dimension of community prayer right from the start, and, on a more practical side, we started with the choice of the church that would host us: the cathedral. We meet every Thursday evening 19:30 – 21:00 for prayer and formation. 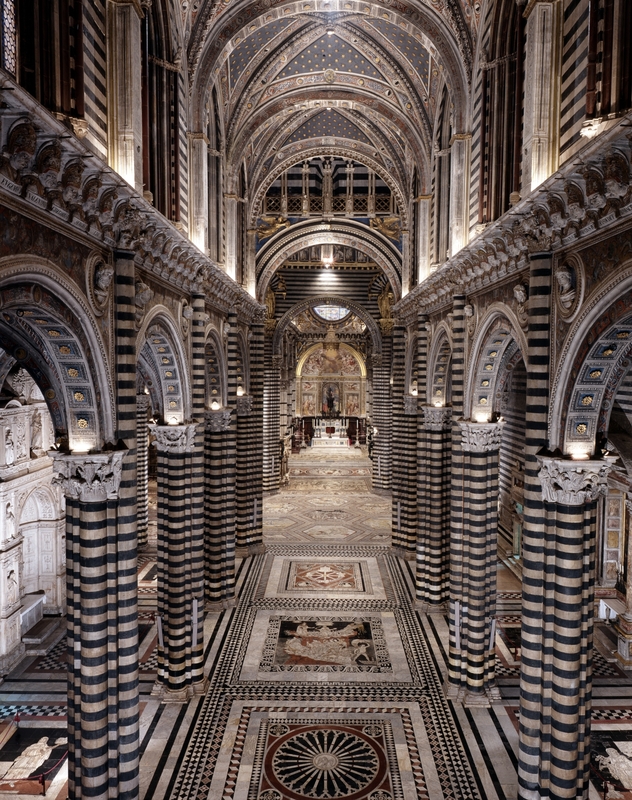 With its long history, the complex of the Cathedral of Siena represents one of the most famous monuments in the western artistic scene. The present building, with both Romanesque and Gothic features, is entitled to the Virgin in the Assumption, the patron saint of the city. According to tradition, the first building was built around the ninth century, replacing an ancient temple dedicated to the goddess Minerva. However, only from the second quarter of the thirteenth century the archive documents allow us to follow the building phases of the cathedral. Countless masterpieces are preserved inside. In many respects, the most remarkable one is without doubt the Floor, elaborated with the technique of marble intarsia and whose decoration – which includes fifty-six panes and datable between the fourteenth and nineteenth centuries – numerous artists contributed to. The quality of the sculptures is at the highest level, with masterpieces from the Middle Ages, Renaissance and Baroque age: the Pulpit by Nicola Pisano (1265-68), the decorative cycle prepared by his son John for the facade (1287-98), the St. John the Baptist bronze statue by Donatello (1455-57), the statues sculpted by the young Michelangelo for the chart of the Piccolomini altar (1501-04), or by Gian Lorenzo Bernini for the Chapel of the Madonna del Voto (ca. 1660). The range of pictorial evidence is not less rich, and of it we will definitely have to remember the impressive cycle of frescoes in the apse, by the Sienese Domenico Beccafumi executed between 1535 and 1544, and describing the Ascension of Christ in Glory, a Virgin with Saints Peter and Paul and two groups of Apostles (later modified in their iconographic structure because of the 1798 earthquake damage); the beautiful painting of the Sermon of St. Bernardino by Mattia Preti (also known as the “Cavalier Calabrese”), sent to Siena from the island of Malta in 1674. Being a ‘newborn’ community, we are dedicating our time to both artistic and spiritual training, in order to welcome pilgrims as “Blessed is the one who comes in the name of the Lord” (Psalm 117). Our first day of service as Living Stones is on Saturday, September 24, which will inaugurate the monthly meetings of 2016, set for October 29, November 26 and December 10. Our community is quite numerous: eighteen Living Stones, accompanied by a priest, the Rector of the University Chapel of Siena, and two sisters of the order ‘Figlie della Chiesa’, precious guides on the path of prayer, opening ourselves up to Ignatian spirituality. We were born within the young ministry of the University Chapel and the cultural contexts in which each of us spent his or her formation are varied: between us there is only one art historian who is busy taking care of our artistic preparation and entirely following it. We meet once a week and, in the meetings that do not involve the study of the church, we practice in the Ignatian prayer style, preparing the physical and inner place where everyone can meditate or contemplate the chosen biblical text, entering there thanks to the delicate and deep paths prepared by the religious people at the service of the community. After the personal conversation with the Lord, we always leave space to a free sharing that makes us grow in the will to give ourselves and accept the others. Among our Living Stones there are both students and young workers: we are confident about being able to attract accessions from context in which we were born, promoting the service and other activities designed for this purpose, hoping to build a young community with many trainers started on the journey from now and ready to pass down their organizational experience and the practical one in opening the heart in prayer and evangelization. To contact us or know us better, you can send an e-mail to the following address: pietrevivesiena@gmail.com.